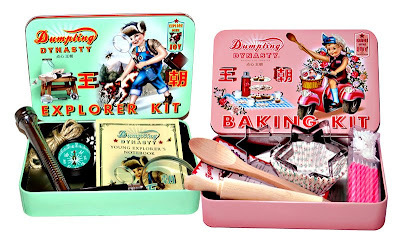 Created by Fiona Hewitt and Andy Tainton experts in asian kitschology, the Dumpling Dynasty brand was inspired by years spent living in Shanghai, Beijing and Hong Kong, trawling the flea markets and junk shops for inspiration. They have created lovely kits packed in beautifull tin cans ilustrated by Fiona herself. They feature stylish retro designs, gorgeous colors and good quality products that make great gifts or keepsakes. There's a shoeshine kit, baking kit, first aid kit and sewing kit, which all look great and are very useful too. Visit www.wuandwu.com to view their products or http://www.fionahewitt.com/ to see more of her illustrations.